Furi is an invertable Drum Spinner. It was designed to have as wide of an impact area as possible. There are 4 weapon screws on the drum, where 2 are in the front and where 2 are spaced further apart in the back. It has 2 wheels and skids for drive, and a belt attached to the weapon. Loss was due to gearbox not interfacing correctly interfacing with the motor as well as potential shorts in the weapon motor. Unknown electrical issues caused short to the frame and prevented robot from starting as well as causing sparks when metal contacted the switch and the frame simultaneously. Drive motor did not interface with gearboxes consistently, leading to having 1 wheel drive and generally inconsistent ability to turn and move. High friction between the bearing and the weapon spacers caused the weapon motor to overheat and likely cause a short inside the motor. Poor manufacturing lead to puzzle fits and the drum to fit poorly, leading to concave side plates, causing the high friction mentioned above. Electronics were not insulated fully from the frame, causing electrical problems. Poor tolerances caused many parts to need to be filed in order to fit together properly, this created many hours of additional labor. This robot was completed too close to the deadline, which severely restricted the available window for testing and fixing problems, leading to many of the problems described above. The wide weapon area made the robot difficult to approach. The robot was too wide and too long, this caused handling to be adversely affected, in addition the robot was very thin, which did not allow electronics to be placed vertically. Even with the large footprint of the robot, it was very difficult to fit the electronics in the robot. The puzzle fit should be manufactured in such a way to allow the parts to more easily fit together. 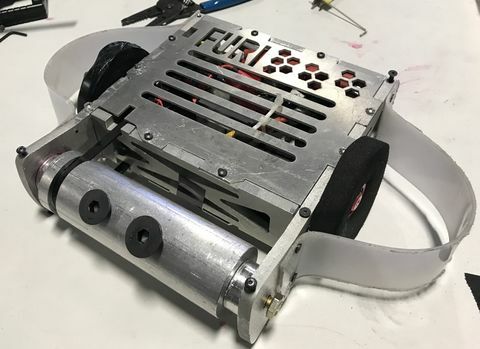 The robot should be finished at least 1.5 weeks from the competition date in order to allow for potential problems that may require ordering new parts and/or machining new parts. Screws should be locktighted so that they do not counter rotate out of the weapon spacer. Machining should be done with more care to prevent the interfacing issues described above. This page was last edited on 26 March 2019, at 15:46.